This semester various year 9 and VCAL students from Cire Community School have been participating in an outdoor education project. 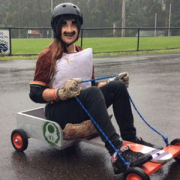 This project supports the Victorian Health and Physical Education curriculum and the Learning Outcomes for their Personal Development Skills strand. Over the year our students have been engaging in various activities designed to challenge, empower, develop leadership and teamwork skills and also connect to nature. 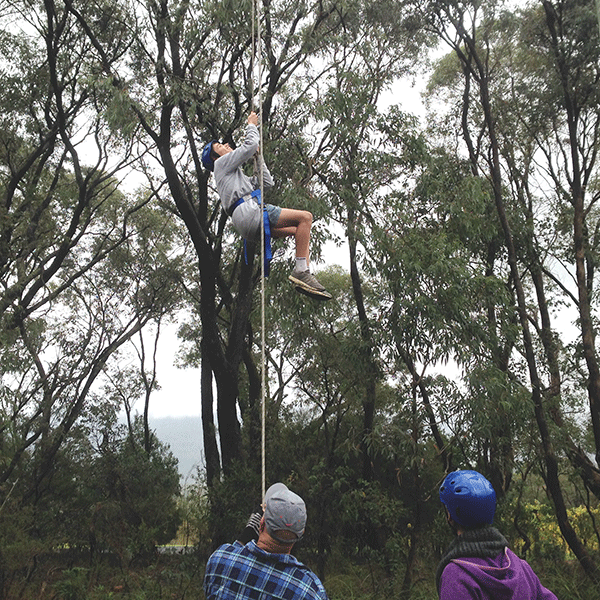 Students had the opportunity to participate in a high ropes experience facilitated by John (Camp Manager – St John’s Ambulance Camp in Wesburn). The high ropes course is conducted in a safe and controlled environment which is designed to challenge the students physically and mentally, take them out of their comfort zone and give them the opportunity to experience self- empowerment through personal risk taking. The course is also designed to allow students to practice in a team environment and to instil a sense of responsibility towards their peers. On the day of the excursion, the students were both equally excited and nervous. 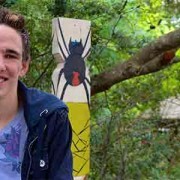 Not knowing for sure what to expect, the student expressed worries that their experience would be limited by factors such as, a fear of heights and some self-doubt. 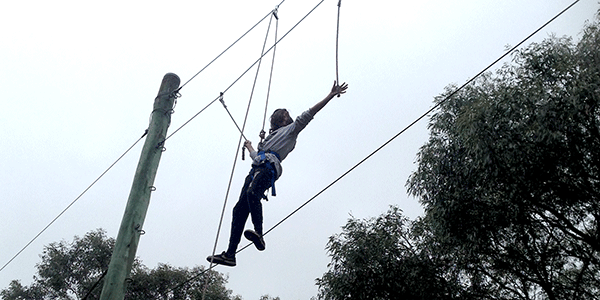 But to their credit, every student had the courage to rise above their fears, and have a go. All the students achieved their personal best and pushed themselves to finish the course, despite the challenges. 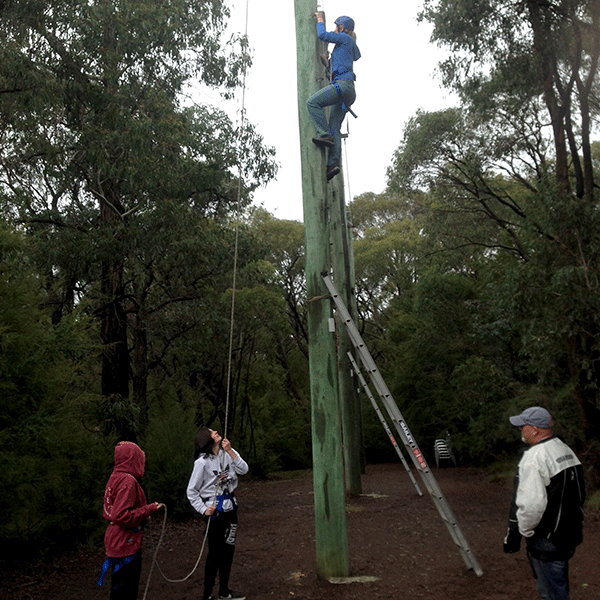 For some of the students, this meant combatting their fear of heights by climbing to the height of the rope. For others, this meant stepping onto that rope and trusting in their classmates to keep them safe whilst they were belayed from the ground. For the students on the ground, it was an opportunity to demonstrated teamwork and leadership skills. It was wonderful to see the students working together and believing in themselves knowing that they completed these challenges. At the end of the day, on the bus ride home, there was a feeling of exhilaration. The students although exhausted had a fantastic time. One of the highlights for me was seeing the students facing their fears and uncertainties head on. The students showed great teamwork and pride in what they accomplished. It is always amazing knowing, that when you feel that a task will be impossible, it only takes that first step, to be pushed beyond what you believe is the edge of your capabilities. 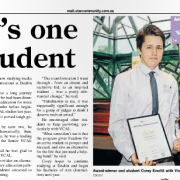 This was a special event for not only the students but for us to be proud of. We would like to thank John, from the St John’s Ambulance, for his ongoing humour, enthusiasm throughout the whole experience and for supporting all of our wonderful and courageous students. 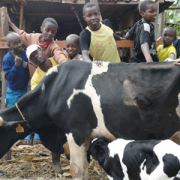 These are just some of the empowering activities Cire Community School students partisipate in. 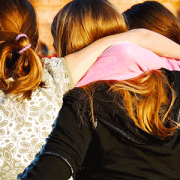 If you would like to know more about our educational services click here or call 1300 835 235.